I am writing this post to introduce a few free web-based as well as desktop applications to split a large PDF document into smaller files. I hope you will love the suggested PDF splitter applications and find them very helpful. Recently, I needed to cut a big PDF file (50 MB) into two equal parts. I did research to find out helpful solutions do the split operation. I found many applications when I searched a query “How to split 50 MB PDF file into half”. But choosing a suitable one is quite difficult which I confirmed later by examining features. Find A Suitable Free PDF Splitter from the List! Here is a list of the best free PDF splitter tools. These applications let you split PDF files easily into required number of documents. All these PDF cutters are available free and can be used online or downloaded to a Windows PC. These PDF splitting programs provide numerous features to do split operation over large PDF documents. So, go through this free PDF cutters list and see which ones you love the most. 1. Free PDF Splitter by OnlineFreeware.net: This is the solution which I used earlier for breaking 50 MB PDF file in half. I just uploaded my PDF file, choose the first option and enter 2 in the box and then click the Split PDF button. It takes a while to upload and split PDF into two documents. I will also recommend this Online PDF Splitter tool to other needed users. 2.Adobe Acrobat Pro: This is a complete PDF management application developed by Adobe System. It is a paid solution, but available free of cost for 30 day trial. So you can also use it for splitting PDF document into smaller parts. 3. 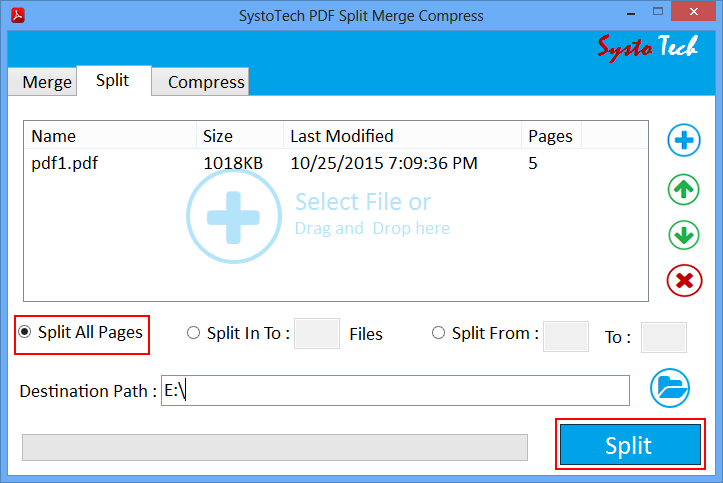 SystoTech PDF Split and Merge: This is another free PDF splitter application developed by SystoTech which can be used to split a large PDF document into smaller parts. 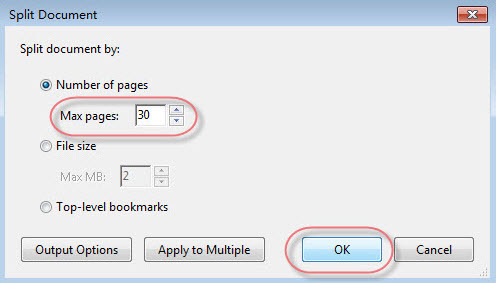 The tool provides three options to split PDF document. 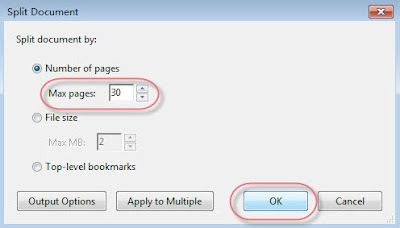 Split All Pages: To separate all pages of PDF file. Split into_ Files: To split PDF file into required number of PDF documents. Conclusion: In this article we have suggested self-experienced solutions to split PDF file into two or more parts. We hope you will love these applications. You can share your feedbacks or suggestions by putting comment.